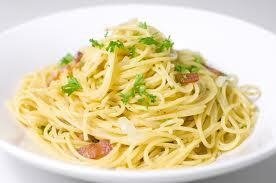 Carbonara is a popular Italian pasta dish made with eggs, cheese, bacon, and black pepper. Spaghetti is usually used as the pasta; however, fettuccine noodles can also be used. The original carbonara (Italian traditional style) is not really cooked with cream, but as it was adopted and cooked by different nationalities, there grow a lot of variations in cooking it. Well, variations are only seen on the additional ingredients used, like veggies (you can also add one if you want, but be sure it complements well with the other ingredients). Pasta, here as the main ingredient, is known to have many health benefits. Did you know that in Western countries, they don’t eat much of rice? Yes, because they just depend on pasta and breads. So obviously, pasta here is a good source of carbohydrates. What’s more interesting is that, even though you take loads of this, you won’t get obese. Another healthy ingredient is the cheese which on the other hand is a good source of protein since it came from milk. So as you see, this carbonara is really a dish that completes your diet table plus the garlic bread which is also nutritious. So, this is it! Review and carry out all the said instructions below and make a good carbonara! Enjoy! In a pan, heat oil and saute garlic and onion. Add 3/4 of fried bacon and ham. For additional ingredients, you may add 250 grams of mushrooms and a can of tuna saute together with bacon and ham.